By the time Saturday Night Live began Season Four in 1978, the series was clicking on all cylinders. Supported by great writing and with dozens of sketches under their collective belts, the Not Ready For Primetime Players had become appointment television. Bill Murray had joined SNL‘s cast for Season Two, replacing breakout star Chevy Chase, and seamlessly fit in with cast holdovers Dan Aykroyd, John Belushi, Jane Curtin, Garrett Morris, Laraine Newman and Gilda Radner. For that 1978-79 season, the series’ writers were churning out great sketches that fed into the actors’ talents. Several years earlier, a PBS series aired what is considered to be the first reality series. 1973’s An American Family chronicled the lives of a real-life upper middle class family and ran for 12 episodes each Thursday night from January to March. Sourced from 300+ hours of footage, its producers presented the lives of the Loud Family. Carrie Fisher was the guest host for the sixth episode of SNL‘s Season Four, which aired November 18, 1978. The actress was just 22-years-old and her breakout role in 1977’s Star Wars was still fairly recent. “Well, maybe you and Mom scared them away,” shouts Radner. Soon Radner’s’ date arrives, played by a soft-spoken Aykroyd. “I want you to meet my sister Joan,” screams Radner. “Hi,” shouts Fisher. “You can tell you’re sisters,” says Aykroyd. Belushi’s character arrives, still dressed from work as an airport _. He’s got his noise canceling headphones on. Aykroyd whips out a joint. “Hey, this is great pot,” shouts Fisher. Mom and Dad, having heard her, run downstairs and reprimand their daughters in another room. Aykroyd turns to his new friend and says: “What is it with this family? 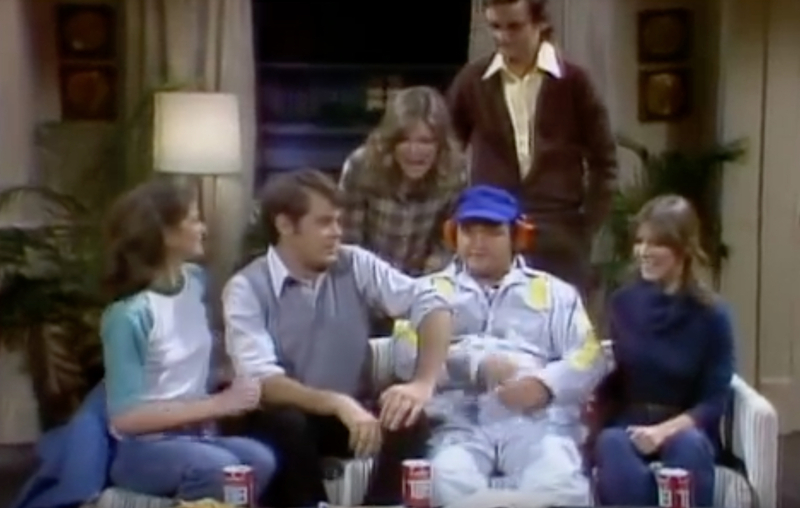 They seem to talk extra loud.” Belushi’s reaction is priceless. Still more shouting by the family is interrupted by the doorbell. It’s a police officer, played by Garrett Morris. “Excuse me, but you’re all gonna have to quiet down,” he says. “Oh, I’m sorry. Who complained?” shouts Murray. The studio audience roars at Morris’ answer. Two years later, Fisher appeared in The Blues Brothers movie.